This is a compilation of works and messages by Tozer printed by Christian Publications in 1997. The editors call this side of Tozer a “cherry bomb” when applied to today’s church, and I agree. 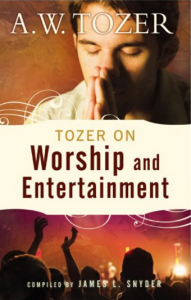 Nevertheless, they say, Tozer needs to “have his say,” and I agree. “It is scarcely possible in most places,” says Tozer, ” to get anyone to attend a meeting where the only attraction is God.” And that was written forty years ago!